Church master planning by Carlson Studio Architecture - come see! Located in sunny Sarasota, the Church of the Palms was established as a mission church in 1957 with 168 Charter Members. Since that time it has shown steady growth. The Church of the Palms is an active, growing, and dynamic family of Christ offering opportunities for worship, fellowship, education and service to all age groups. There are 6 existing buildings on campus in 2014. All existing structures are located on the North half of the site. 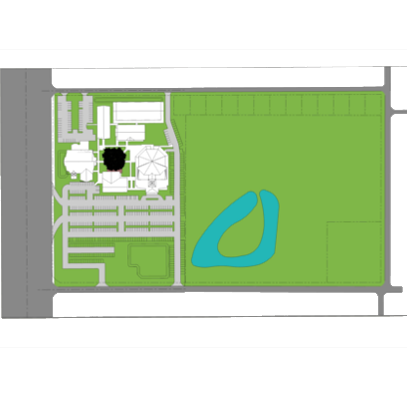 The total square footage of all the existing buildings at the start of this study was about 67,744 SF. 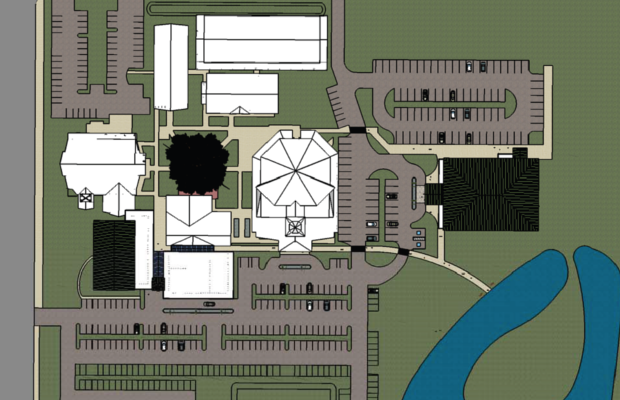 Phase one included: building a new family life center, building a new welcome center, remodeling the existing Memorial Chapel, and site work to improve the way-finding on campus. 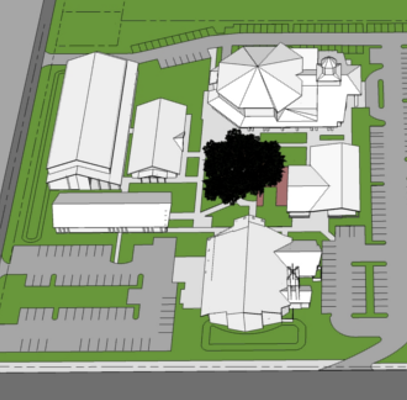 Phase two will include: building a new education building connector between ECC, administration, & music buildings, building a new church administration building, and remodeling the original administration building to serve community outreach. 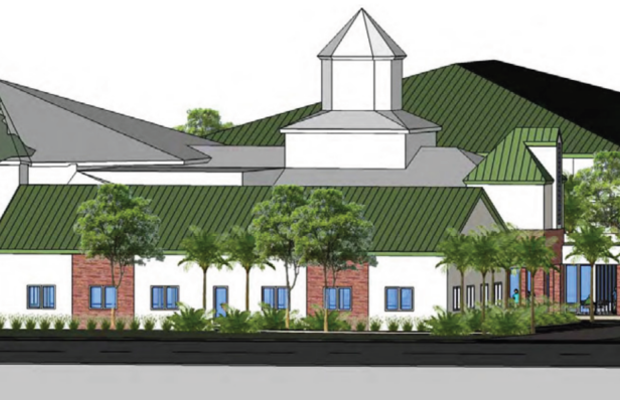 Phase three will include: building a new early childhood center, and remodeling the existing education building. Phase four included; building a new music building, and remodeling the original music building. 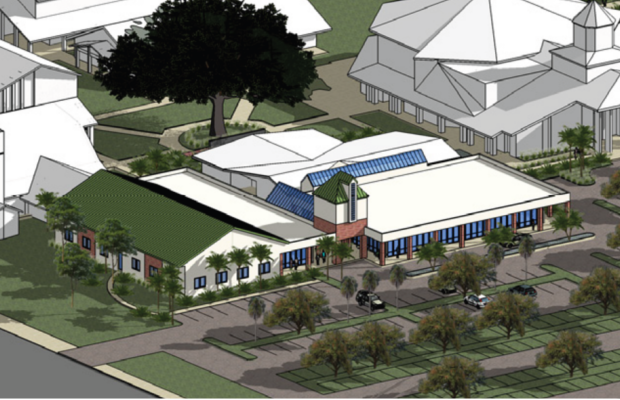 The design team was asked to create a master plan to provide for the needs of this church on this site. The study looked at an initial phase of work, and then a 5 year, 10 year and 20 year window of potential development on this site. 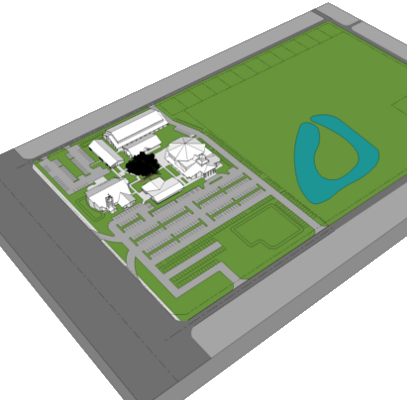 A facility program was created to determine the current and projected needs of the church, prior to beginning the master plan. The master plan was accomplished from May 2014 to October 2014. 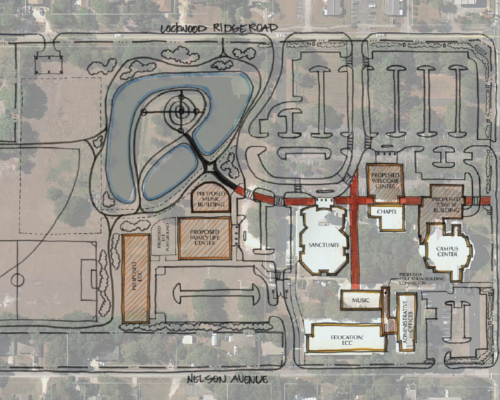 After considering hundreds of options and scenarios during the planning process, and developing three distinct design approaches, one option received almost unanimous approval. This Master Plan was divided into four main phases, and included some subphases were appropriate. All phases combined, propose the addition of 54,900 building square footage, and the remodeling of 35,673 square feet in existing buildings. The Family Life Center is 21,000 square feet and is located on the south side of campus. The first floor includes a two-story gymnasium, foyer, kitchen, two youth classrooms, storage & mechanical rooms, and locker rooms. The second floor includes a balcony looking down to the first floor of the gymnasium, three classrooms, a conference room, restrooms, and storage & mechanical rooms. The Fellowship Pavilion is 5,600 square feet and is connected to the Memorial Chapel on the west side, centered on the campus. This building is similar to a welcome center, cafe, and/or town hall as it will be a great place to congregate, grab a coffee, read a book, or have a small meeting. As one enters the main campus they will see a tower entry piece as they walk from their car to the two main sanctuaries. From the tower, if they go right they will enter the Fellowship Pavilion and if they go left they will enter the Administration Building.